Dams are structures that hold back water in a stream or river, forming a lake or reservoir behind the wall. 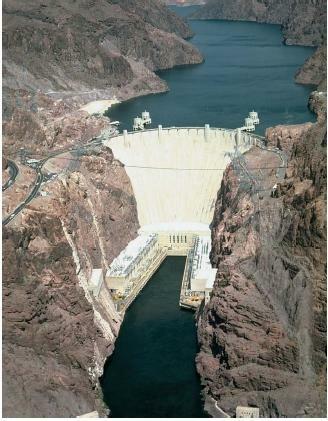 Dams are used as flood control devices and as sources of hydroelectric power and water for crops. Dams are designed to resist the force of the water against them, the force of standing water—not a running stream. There are five main types of dams: arch, buttress, earth, gravity, and rock-fill. Arch dams are curved upstream, into the water they hold back. They are typically built in narrow canyons, where the high rocky walls of the canyon can withstand the pressure of the water as it pushes off the arch and against the walls. A buttress dam uses the force of the water to support it. A slab of concrete is tilted at a 45-degree angle and has buttresses (supports) on the opposite side of the water. While the water pushes down on the slab, the buttresses push up against it. These counterforces keep the slab in balance. Because of the large number of steel beams needed in construction, however, these dams are no longer popular because steel and labor are too expensive. An earth dam may be a simple embankment or mound of earth (gravel, sand, clay) holding back water. An earth dam might also have a core of cement or a watertight material lining the upstream side. A gravity dam, made of cement or masonry, withstands the force of the water behind it with its weight. To accomplish this, a gravity dam's base must have a width that is at least two-thirds the total height of the dam. The dam wall is typically given a slight curve, which adds extra strength and watertightness. Rock-fill dams are embankments of loose rocks covering a watertight core, such as clay. The upstream side of a rock-fill dam might also be constructed with a watertight material. While dams can help save lives, irrigate farmland, and provide hydroelectric power, they can also damage farmland and the environment. Building a dam changes the ecology of the surrounding area, flooding the habitats of plants and animals. Currently, before a dam is built a full-scale environmental impact study is made to determine if any endangered species would be threatened by a dam's construction. In some areas of the world, however, progress far outweighs the need to protect endangered species or the lives of many people. This seems to be the case, with the giant Three Gorges Dam being built on the Yangtze River in central China. Expected to be completed sometime in 2003, the dam will create the world's largest hydroelectric project and a huge new lake. It will stretch nearly 1 mile (1.6 kilometers) across and tower 575 feet (175 meters) above the world's third-longest river. Its reservoir would stretch more than 350 miles (563 kilometers) upstream. By the time the newly created reservoir reaches its maximum height in 2008, it is estimated that 1.1 million people will have been relocated (some sources say as many as 1.9 million people). Many international organizations have criticized the project, saying it threatens the environment and dislocates many people who are merely being resettled in already overcrowded areas. I am searching for this type of project only. thanks to publisher. this page has helped me have a more deeper understanding about dams. i would like to say as a girl of 11.
i hope to get a 100 for my project. using the new understanding that you have given me. types of dams and their construction & diagram and the method of constructing them . Hi what is four piller type in reservoir .function of this and urse mainful for damthe dam.how long main dam .